Jerry D. Morelock, PhD, Colonel, U.S. Army (Ret. ), is a 1969 West Point graduate who served 36 years in uniform in numerous command and staff positions. He is a decorated combat veteran whose military assignments included the Leadership Division of the Department of the Army general staff and the Strategic Plans and Policy Directorate on the Joint Chiefs of Staff in the Pentagon. His final active-duty assignment was as the director of the Combat Studies Institute, the history department of the U.S. Army Command and General Staff College at Fort Leavenworth, Kansas. As a military historian, he has authored several books and published over 300 articles in history journals and magazines. His writing awards include receiving the Arter-Darby Military History Writing Award for excellence in professional scholarship, winning the U.S. Field Artillery Association History Writing Contest, and selection as a Distinguished Essayist in the Chairman of the Joint Chiefs of Staff Essays on Strategy competition. After retiring from the Army, he was executive director of the Winston Churchill Memorial & Library at Westminster College in Fulton, Missouri--the site of Churchill's famed 1946 "Iron Curtain" speech. He continues to serve as an adjunct faculty professor at Westminster College, teaching courses in history, political science, and American foreign policy. Since 2004, he has been the editor-in-chief of Armchair General magazine, the only military history magazine selected by the Chicago Tribune as one of its annual list of "50 Best Magazines in the World". Carlo D'Este is the author of Eisenhower and Decision in Normandy. 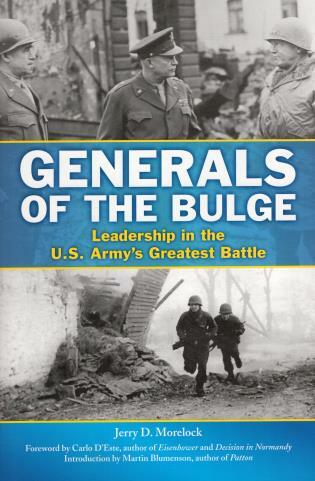 Martin Blumenson is the author of Patton.